Published: April 19, 2013 at 12:09 p.m. Updated: April 19, 2013 at 11:48 p.m. 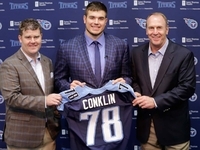 In the days leading up to the 2013 NFL Draft, NFL.com will allow users to determine the best and worst draft picks for every team. The series continues with the team that owns the No. 26 overall pick in this year's draft, the Green Bay Packers. When the idea for this series was initially hatched, we were going to limit the range of picks to the " Super Bowl era" of NFL drafts. When Jim Reineking and I sat down to write the Packers list, we figured this limit was appropriate as it'd be unfair to open up the Packers' drafts that built Lombardi's dynasty in the '60s. For example, from 1956-58, the Packers drafted five Hall of Famers ( Forrest Gregg, Bart Starr, Paul Hornung, Jim Taylor, and Ray Nitschke) who are all considered some of the greatest players in NFL history (Starr, Gregg, and Nitschke made NFL Network's Top 100 players of all-time). So, with that in mind, we ventured off into Packers draft lore after 1967. Here's what we came up with. As Aaron Rodgers tumbled farther down into the first round of the 2005 NFL Draft, the Packers brass had a choice: draft Rodgers, prepare for the future, or roll the retirement dice with Favre for the next several years and hope another good QB was available when Favre eventually called it quits. Fortunately, they chose the former. Pairing Rodgers with quarterback guru Mike McCarthy to develop behind Favre was a savvy move, as Rodgers is now the premiere quarterback in the NFL. There are others that do certain things better than Rodgers, but none that do everything as well as him. Rodgers has a Super Bowl title, Super Bowl MVP, and MVP to his name already and he's not even 30 years old. 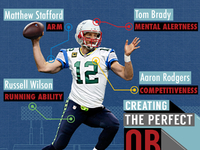 Rodgers owns several NFL records, and likely isn't done rewriting the record books just yet. 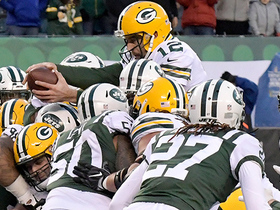 As long as he's under center, he gives the Packers a chance not just to win, but contend. Trading up for Packers general manager Ted Thompson is about as rare as a warm December day in Green Bay. Yet, in the 2009, needing an outside linebacker for new defensive coordinator Dom Capers 3-4 defense, Thompson traded back into the first round to take Matthews, a former walk-on at USC who wasn't projected by many pundits as a first-round talent. Fast-forward to 2013, where Matthews just became the highest paid linebacker in the league thanks to his stellar output over the first four years of his career (including four Pro Bowls). Matthews has collected 42.5 sacks in 58 career games and finished second in Defensive Player of the Year voting in 2010. Matthews' impact is felt just as much in the playoffs as it is in the regular season. Were it not for a key fumble forced by Matthews in the Super Bowl, Steelers fans might just be bragging about seven Lombardi trophies instead of six. 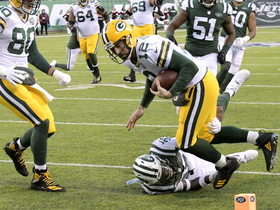 Impact players make plays when it matters most, and Matthews has already proven more than capable in his young career as he holds the Packers record for postseason sacks. With him and Rodgers under contract, the Packers have two of the games' best players and two of the games' most critical positions. That's some good drafting right there. The Packers offense was in need of a spark in 1978. In comes Lofton, a collegiate long-jumper and sprinter at Stanford who brought a dynamic new element to the Green Bay offense -- the ability to stretch the field. Lofton was named to seven Pro Bowls in eight years in Green Bay, and twice led the league in yards per catch. Those numbers, by the way, were a ludicrous 22.4 ypc and 22.0 ypc in 1983 and 1984, respectively. When Lofton retired, he was the Green Bay Packers all-time leader in receptions and yards, records eventually surpassed by another member of this list. Lofton is a member of the Pro Football Hall of Fame, and deservedly so. While the Packers as a team struggled throughout the 80s, what many forget is their offense did not, and Lofton was a key reason why. Despite not qualifying for the playoffs, in 1983 the Packers fielded the fifth best offense in the NFL behind the Lynn Dickey-James Lofton connection that counted for 1,300 yards and eight touchdowns. Kabeer Gbaja-Biamila, or KGB as he was affectionately known by the Packer faithful, was a tough selection to make this list over other Packers greats (such as Sterling Sharpe or Leroy Butler). However, when you find your all-time sack leader in the fifth round, it deserves some attention. KGB was considered undersized by many coming out of San Diego State in 2000, but the Packers took a chance on him and were richly rewarded. He became the first Packer to record double digit sacks in three straight seasons in 2003 (each of his first three years in the league). KGB made his noise as a pass-rusher, and endured a long, healthy career in Green Bay, even after he accepted a lesser-role as a pass rush specialist in the twilight of his career. Even though Clay Matthews will likely break KGB's record, for now his 74.5 sacks stand as the most for a storied franchise. They are even more sacks than the legendary Reggie White had while wearing the Green and Gold. Not too shabby for the 149th overall selection. Want to know how much of an impact Donald Driver had on the Green Bay Packers? Look no further than the retirement extravaganza the team threw for him when he finally announced he was hanging up the cleats. 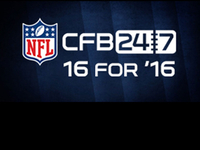 Driver was a seventh round selection out of tiny Alcorn State University, but never let that hold him back. Driver was one of two players from 2004 to 2009 to post consecutive 1,000 receiving seasons, sharing that distinction with Reggie Wayne of the Colts. Driver currently holds the record for receptions and receiving yards as a Packer, beating out Hall of Famers James Lofton and Don Hutson. He made it to four Pro Bowls in his career, and is one of only 38 players in NFL history with over 10,000 receiving yards. Driver was an inspiration on and off the field for all of Wisconsin with his unbeatable work-ethic and ear-to-ear grin. The fact that he helped the Packers get to and win a Super Bowl in 2010 is just icing on the cake. With five future Pro Football Hall of Famers (Ronnie Lott, Mike Singletary, Howie Long, Rickey Jackson and Russ Grimm) still on the board, the Packers opted to go with a "franchise quarterback" and selected Campbell out of California. Campbell couldn't crack the starting lineup, as Lynn Dickey emerged from the morass to become a Packers legend. Campbell was a backup when Dickey produced one of the finest seasons ever for a Packers passer (and that's saying something given the collective excellence of Bart Starr, Brett Favre and Aaron Rodgers). In 1983, Dickey threw for 4,458 yards, which is second in team history to the 4,643 yards posted by Rodgers during his 2011 MVP season. Campbell, meanwhile, lasted just four seasons in Green Bay and appeared in just seven games. Thirty years later, Campbell was left pondering his place among the Packers' all-time draft busts, and current Packers fans can be thankful that the other Cal QB the team selected in the first round has turned out spectacularly. 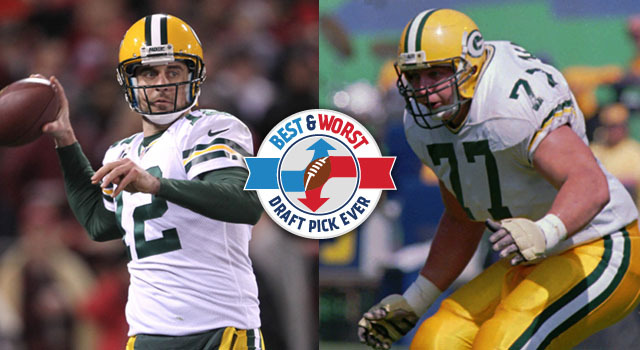 The Packers really swung and missed (badly) with first-round selections in consecutive drafts. 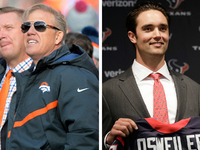 A year before the Campbell selection, the Packers had an even bigger draft disaster. One pick after the Cincinnati Bengals took Pro Football Hall of Fame offensive tackle Anthony Munoz, the Packers nabbed Clark -- a defensive end from Penn State. Instead of playing in Green Bay, Clark opted to ply his trade in the Canadian Football League with the Toronto Argonauts. After two years in the CFL, Clark returned to the NFL, but rather than play for the Packers he went to the New Orleans Saints instead. 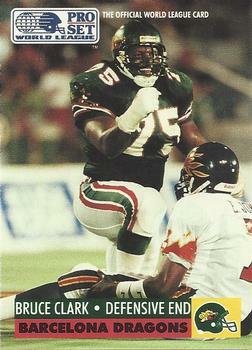 Clark's pro football career ended in the World League of American Football with the Barcelona Dragons. General manager Ted Thompson doesn't miss much on draft selections, but this is the black mark among some otherwise stellar selections. Harrell entered the 2007 draft with injury concerns, and the defensive tackle never could shake that bugaboo. Harrell made just two starts over seven games in 2007, and barely saw the field in the three seasons that followed. By 2011, he was out of the league and his status as a draft bust was secured. 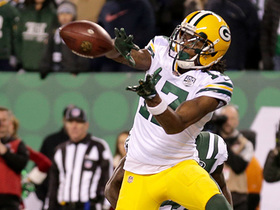 While the Harrell pick is among the team's all-time worst, the Packers redeemed themselves later in the 2007 draft, selecting four players who would make valuable contributions on the Super Bowl XLV-winning team: Running back Brandon Jackson (second round), wide receiver James Jones (third round), linebacker Desmond Bishop and kicker Mason Crosby (both in the sixth round). Four of the first five picks in the 1989 draft are in the Pro Football Hall of Fame (Troy Aikman, Barry Sanders, Derrick Thomas and Deion Sanders). Three of those four (Sanders, Thomas and Sanders) were selected immediately after Mandarich. 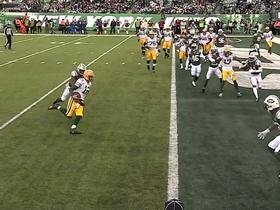 For the pre-Brett Favre/Mike Holmgren/Ron Wolf and severely talent-starved Packers, a miss of this mangitude was disastrous. Three years later, Mandarich went from "the best offensive line prospect ever" to "the NFL's incredible bust," and the Packers were forced to do a total reboot (thankfully, minus the garish new uniforms that often accompany such moves in this day). Only the epic failures that were Ryan Leaf and JaMarcus Russell keep Mandarich from owning the title as the biggest draft bust in NFL history. This draft pick hits a new stratosphere of atrociousness when you consider the trade the Packers made to acquire the No. 10 overall selection in 2001. The Packers shipped backup quarterback Matt Hasselbeck and their No. 17 overall draft pick to the Seattle Seahawks for the selection used on Reynolds. With that 17th overall pick, the Seahawks selected guard Steve Hutchinson, who is a seven-time Pro Bowl selection and a member of the NFL's All-Decade Team for the 2000s. Over three years, Reynolds appeared in 18 games (no starts) and registered just three sacks. Adding insult to injury, the Packers attempted to trade Reynolds in 2004 to the Indianapolis Colts, but the trade was voided after Reynolds failed a physical.